Winter Garden City Hall is located at 300 West Plant Street, Winter Garden, FL 34787; phone: 407-656-4111. Photo: Luther F. Tilden House, ca. 1877, 940 Tildenville School Road, Winter Garden, FL. Listed on the National Register of Historic Places in 1996. Photographed by User:Ebyabe (own work), 2007, [cc-by-3.0 (creativecommons.org/licenses/by/3.0)], via Wikimedia Commons, accessed December, 2015. Winter Garden, initially settled in the 1850s, began to grow significantly after the arrival of the railroad in the 1880s. Early settlement consisted of scattered farms and homesteads along the south shore of Lake Apopka. The local economy depended largely on citrus and vegetable production. By the turn of the century a small commercial district had emerged along Plant Street and residential neighborhoods began to appear. More than a thousand inhabitants lived in Winter Garden at the end of World War I, the beginning of an era of enthusiastic growth throughout Florida. Commercial and residential construction surged, fueled by a real estate boom and expansion into new subdivisions. Florida's economy collapsed in the mid-1920s, though continuing demand for Winter Garden's citrus products moderated the effects of the ensuing depression. The town's population actually rose by 30 percent in the 1930s, slightly exceeding 3,000 inhabitants in 1940. At the close of the historic period in 1945, Winter Garden contained more than five hundred buildings, which constituted an important part of Florida's rich architectural heritage and a cultural legacy worthy of preservation. As with many central Florida communities, the cultivation of citrus crops and development of railroads led to the formal organization and expansion of Winter Garden. The Disston Purchase, a $4 million land sale along the Kissimmee River in 1881, opened a vast area for settlement in the peninsula. The lure of fortune in cultivating citrus led to substantial population growth. Although the original "orange belt" of Florida extended along the Atlantic coast and St. Johns and Indian rivers during the mid-nineteenth century, citrus groves were planted during the 1880s in a "golden crescent" that extended from the upper Indian River to Tampa Bay. Orange County was intensively planted. Railroads opened new areas to settlement and promoted development in established communities. The Orange Belt Railway, organized in 1885, ran from Longwood to Oakland, a settlement west of Winter Garden, by 1886. In 1889, the Tavares and Gulf Railroad constructed an extension east from Clermont to Winter Garden. The introduction of those railroads spurred settlement in Winter Garden and along the south shore of Lake Apopka. In 1889, the Tallahassee Floridian noted that although there was much interest in citrus at the south end of Lake Apopka, the cultivation of winter vegetables remained the dominant agricultural activity. In 1892, a post office opened in Winter Garden and by 1896, the community counted some half-dozen dwellings, A.B. Newton's store, Methodist and Baptist churches, a saw mill, and a railroad depot. Devastating frosts in the winter of 1894-1895 killed thousands of trees, slowing growth in Winter Garden and inducing many farmers to move farther south. In 1900 Winter Garden numbered only some 100 residents, who lived in scattered dwellings dotting the landscape. Winter Garden experienced its first period of significant growth in the second decade of the 20th century. Development was geared to the harvesting and marketing of citrus and winter vegetables, which nearby rail lines carried to markets. In 1908 residents incorporated the Town of Winter Garden, electing A.B. Newton as mayor and G.J. Strozier, J.L. Dillard, R.R. Roper, B.T. Boyd, and L.D. Jones as aldermen. Over the following decade, a small commercial district emerged along Plant Street, the primary corridor through town. Railroad tracks divided the street, providing the town's most distinctive landscape feature. One and two-story brick buildings began to line Plant Street and residential neighborhoods grew around it. The Bank of Winter Garden was organized in 1908. In 1912, the Winter Garden Light and Water Company was organized, built an ice plant and generating station, and extended services into the town. Brick road paving began in 1915. A board of trade, electric and telephone services, newspaper, and a theater were established during the period. The town's population reached 351 in 1910. During the first decade of the 20th century a few wood frame buildings were constructed in the commercial district, none of which remain. Most residential buildings were also wood frame. With few exceptions those dwellings were constructed south of the commercial street and include houses at 110 South Lakeview Avenue, 100 North Main Street, 304 South Main Street, 111 West Smith Street, 302 South Tremaine Avenue, and 130 South Woodland Avenue. The dwellings are associated with several early Winter Garden residents, including Green Bumett, George Dodd, G.K. Ewing, and Rufus Wright. Citrus cultivation spurred the economy. In 1910, nearly 500,000 boxes of oranges were shipped from Orange County, then the largest citrus producing region in Florida. Production levels exceeded 1 million boxes in 1920, when Orange County's share of Florida's $20 million orange crop totaled nearly $5 million. In response to the revitalized citrus market and to help regulate freight rates and sales of citrus, the Florida Citrus Exchange was formed in 1909. In August 1909, the Winter Garden Citrus Grower's Association was organized by L.D. Jones, G.B.W. Bray, and Robert Byrd. They also built a packing house. Jones, an organizing member of the Exchange, served as business manager and secretary between 1912 and 1916. Additional packing facilities were formed, including the Dillard Packing House and Winter Garden Orange Company. 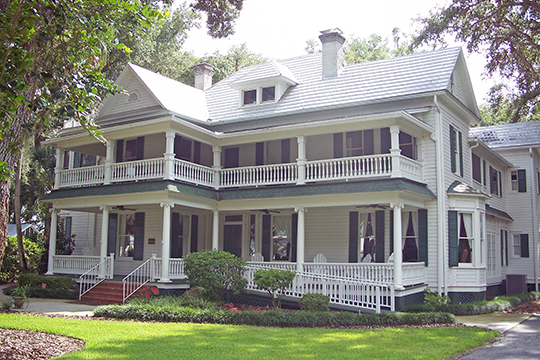 Historic Property Associates, Inc. for The City of Winter Garden, Historic Building Survey of Winter Garden, Florida, 1994, www.cwgdn.com, accessed December, 2015.